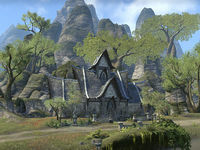 Just outside the Aldmeri settlement of Marbruk, the forest is wide and open, the climate is mild, the setting idyllic: the elegant home of Cliffshade seems an abode blessed by the gods. 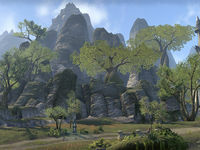 Cliffshade is a medium player house in eastern Greenshade. The entry hall has a fireplace. From the entry hall there is a small room located to the south and stairs to the north leading to the second floor. The second floor is the same size as the entry hall; it has a fireplace and interior balconies to the east and south.